Our next destination the Rhine River valley was a two hour drive from Heidelberg. 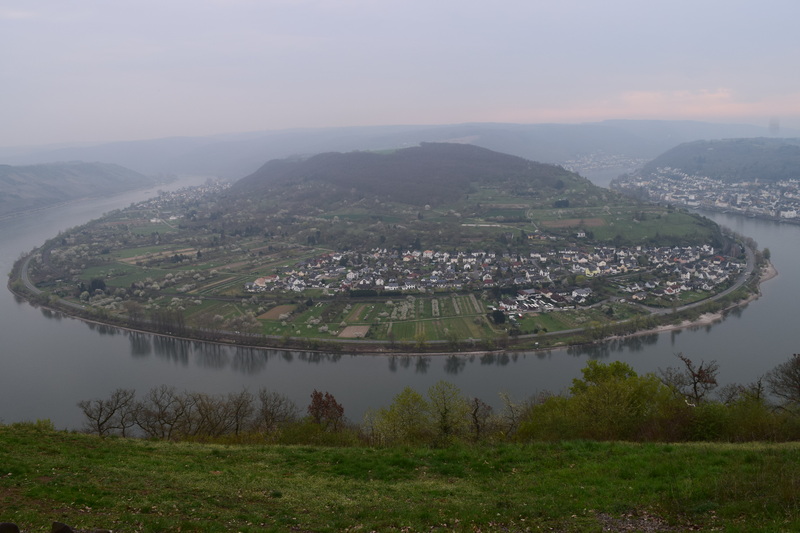 We chose the town Boppard for our home base primarily because we liked the Airbnb. 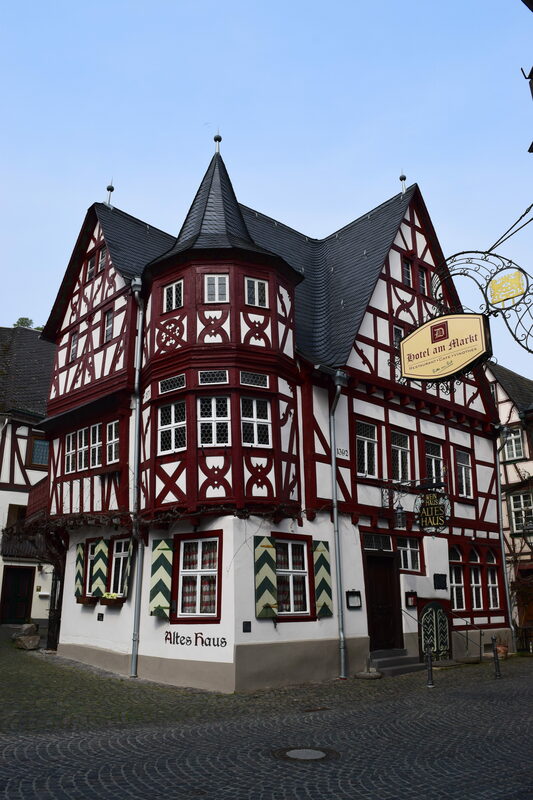 A two bedroom two bath apartment in a building dating back to the 1500s on a town square with a great kitchen and a budget friendly price of $75 a night, total cost for our seven night stay just $526. 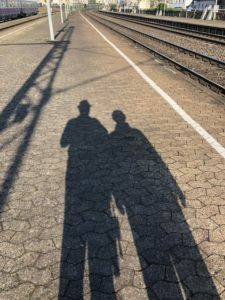 I had taken a ferry down the Rhine in 1983 and we had seen various Rick Steves’ videos so we knew there would be plenty to keep us interested for a week. 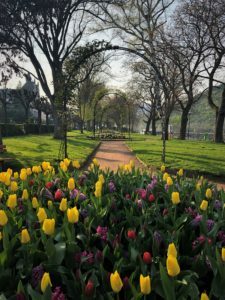 After visiting most of the idyllic German towns along the Rhine from Boppard to Bingen I am glad we chose Boppard and would recommend that anyone staying in the area stay in Boppard. 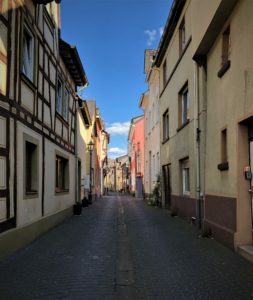 It is small and quaint, with timbered buildings, churches and a town square but large enough to have restaurants, bakeries and a good supermarket. Some of the smaller towns are primarily dependent on tourists and tourism. We learned quickly that the tourist season on the Rhine starts after Easter. So if you are visiting before Easter, as we were, you will find many smaller towns almost completely empty with shops and restaurants closed. 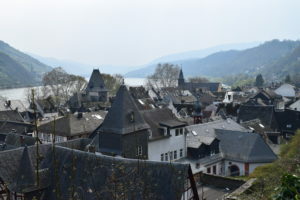 Upon arrival we learned another benefit of Boppard is it’s location in the VAR and the accompanying room tax. I know, why is a room tax a good thing? Well, for $1.50 a night per person you get a visitor card that allows you to ride all of the trains and buses in the region for free. 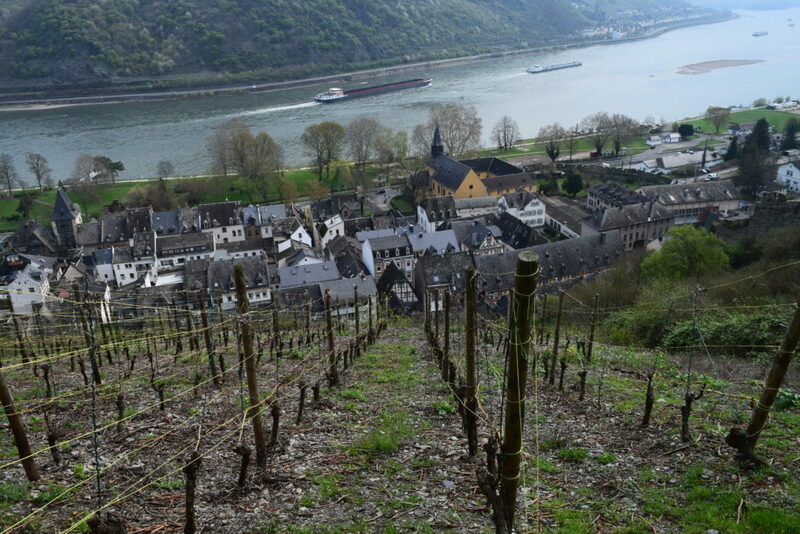 While the VAR does not cover the entire Rhine River Valley it covers a huge region north and west. Needless to say our car remained parked all week and we took the train. 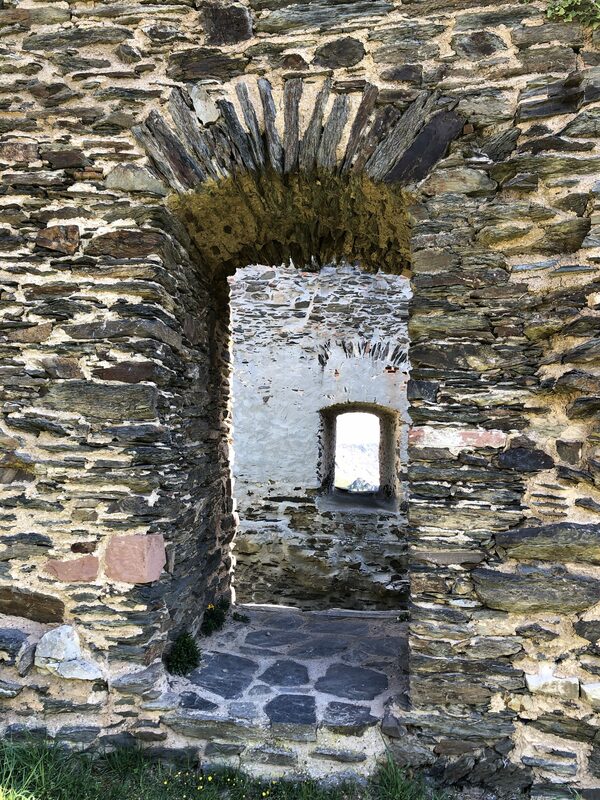 Boppard has a long history with evidence of human settlement in the area going back 13,000 years. 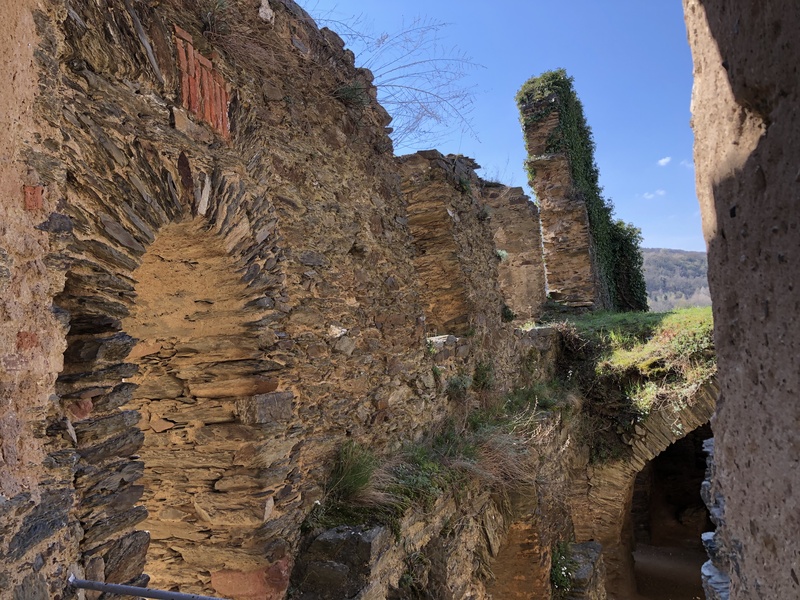 It has impressive Roman ruins with town walls dating to around 400 AD. Over time it has been Celtic, Roman, Germanic, French, Prussian, and for a while held by the Swedes. Breaking from tradition we did not attempt to conquer the city and claim it as our own but we did lay claim to a cafe table in the town square for a few hours in the sun while we sipped beer and played cards. On our first full day we took the train to the neighboring town of St. Goar and paid nothing for the ride thanks to or visitor’s cards. 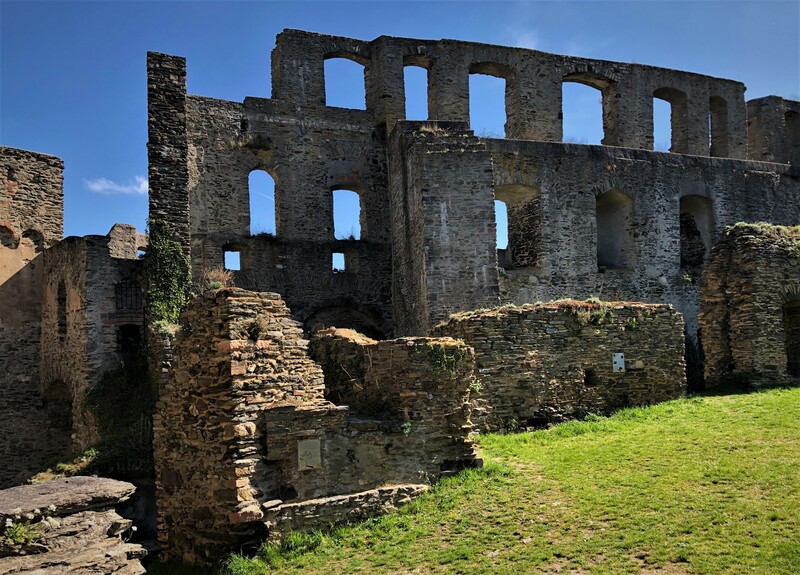 The town boasts the best castle ruins on the Rhine, Rheinfelds Castle, or what is left of it after the French destroyed it in the 1797. Apparently the French were concerned that the Germans might start a war so they destroyed all the castles along the Rhine. Unfortunately, rather than ending the threat of war it simply taught the Germans the virtue of explosives and the uselessness of castles. Thanks to this French lesson you no longer need an army to enter the castle, but you will need €5.00. 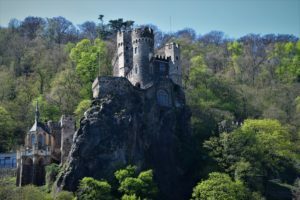 Like most of the Castles on the Rhine there is now an attached hotel and restaurant so if you feel like staying in a castle, or at least right next door to one you have options. 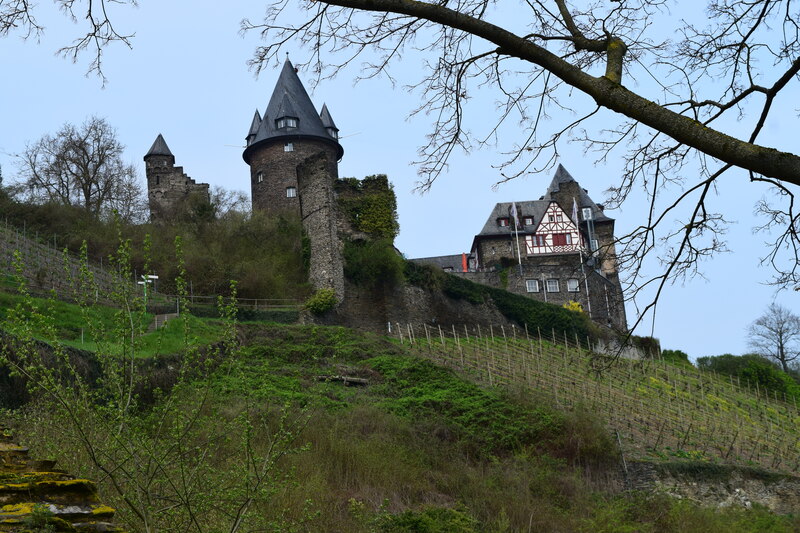 It was a great walk around the castle ruins with wonderful views up and down the Rhine with views of the other castles north and south of St. Goar. 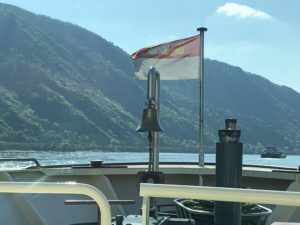 The Rhine has always been busy with commercial traffic so the landed gentry (aka robber barons) along the Rhine realized in the 1200s that if you build a castle and run a chain across the river you could stop and toll all of the boat traffic. 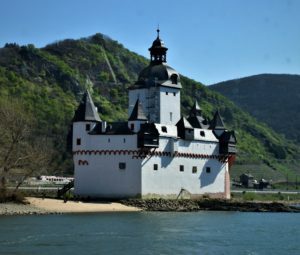 This is why the 64 mile stretch of river from Bingen to Koblenz had 40 castles. The tolls are long gone with the establishment of a united Germany and the economy has changed so now they charge tourists €30.00 to ride down the river to look at the castles. Positive change. 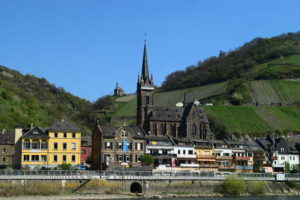 The top rated thing to do in St. Goar according to TripAdvisor is a stop at Stefan’s Wine Paradise. I don’t follow TripAdvisor religiously but any place called wine paradise deserves a stop. Stefan’s is a nice shop selling local wine and brandy as well as cuckoo clocks and souvenirs. We did not get to meet Stefan but Alissa gave us the full tasting of brandy and wine. Alissa was wonderful, kind, generous, informative with excellent English. She is a well traveled chef by training helping out at Stefan’s when she is in town. Unfortunately the wine was not fabulous. In my humble opinion the Germans should stick to beer. Germany’s short growing season is just not conducive to wine grapes, at least not the kind that I like. After a free tasting of at least eight wines we felt obligated to buy something. A bottle of Pinot Noir and a bottle of Riesling which did not improve by the time we got them back to the apartment. We referred to them for the rest of the week as the best of the worst. Each morning and some afternoons Kelly and I would walk the paved path along the river. If you are inclined you could walk for miles, actually about 750 miles. Europe is very bike friendly and has bike routes everywhere. The EuroVelo project is an EU effort to criss-cross Europe with bike routes. EuroVelo route 15 runs the length of the Rhine’s 1233 kilometers. We were not inclined to walk hundreds of miles but did walk a few miles along the river most days. 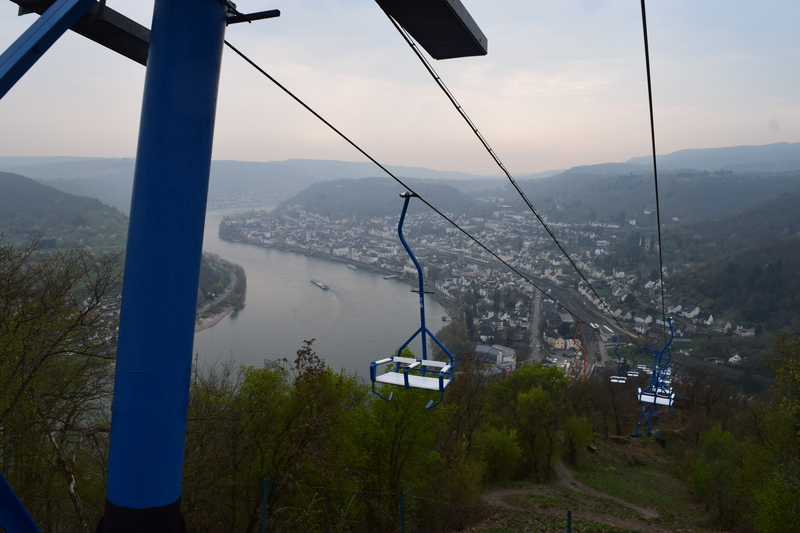 On day two our walk took us to the sesslebahn or chairlift that runs year-round from Boppard to a ridge high above the Rhine. 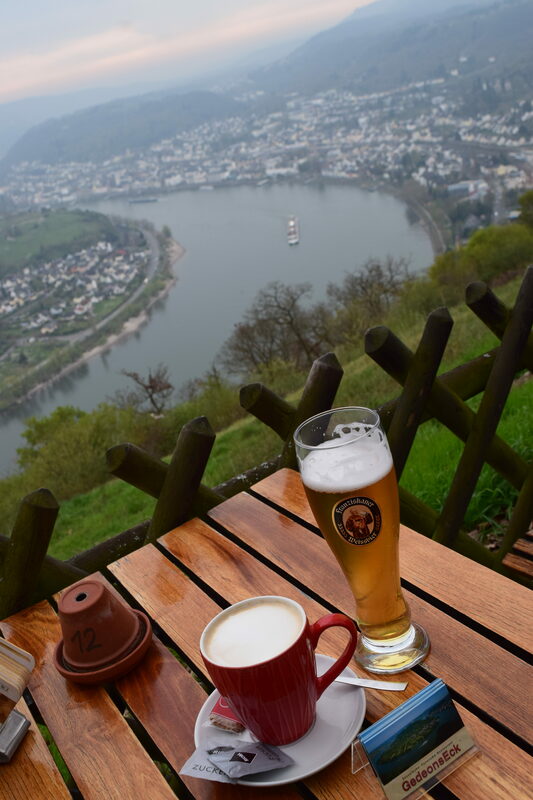 You can use the chairlift to access hiking and biking trails, or you can use it to access the restaurant and bar overlooking the Rhine. We did the later. A good German beer and a great view, a nice experience which I would recommend. I would suggest only getting a one-way ticket for the sesslebahn and hiking either up or down. 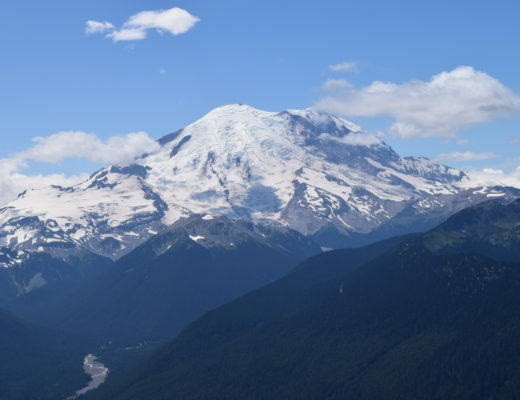 We purchased a round-trip ticket and wished we had hiked up after we saw the terrain. On Wednesday we took the train to Bacharach about 10 miles south. Bacharach is definitely worth a visit, its medieval walls, towers, old churches and timbered houses are amazing. The hike through the hills along the old city wall was one of the best we have had. Some of the houses date back to the 1300s. While Bacharach is beautiful it is also a tourist ghost town this time of year. In our first week in Germany we quickly remembered that lunch in Europe is between 11:30 and 1:30, do not expect restaurants to be open outside those hours. So we thought we were fine walking into Bacharach at 12:15. Not so much. The first 3 restaurants were closed, as were several shops and Hotels…. at noon….on a Wednesday. We finally asked the lady in the florist shop and she directed us to a small restaurant on a back street where we had a nice lunch. The US has its share seasonal businesses, but Europe just has a different focus which takes getting used to. Businesses close for lunch, restaurants are open short hours, many establishments are closed the entire month of August for vacation. Ultimately, I like the fact that Europeans don’t think everything must be open 24/7. Europeans believe that time off is equally important to time on the job. I have come to agree with that philosophy, which is why I have 35 years of time off scheduled. On our last day we decided to take a Rhine River Cruise. Not the luxurious Viking River Cruise advertised on Sunday Morning television, but a nice ferry boat with the KD line. It has the same view as Viking but our cruise cost €59 for two, I think Viking charges a bit more. We boarded in Boppard and with one boat change in St. Goar we made it down to Bingen in about 4 hours. It was a beautiful sunny day and it was great being on the water. Villages and Castles slipped by as we sipped “Italian” wine. At times the boat was crowded and noisy and other times almost empty as it picked up and dropped off groups at various towns along the way. In the end we questioned whether we would recommend the KD cruise to others and decided that if you want to get on the water it is the way to go. If you just want see the castles and maybe stop in a village or two we would take the train. The trains run at least hourly on both sides of the river making it from Mainz to Koblenz in about an hour. To maximize your views and potential stops take the train south on one bank and return north on the other. 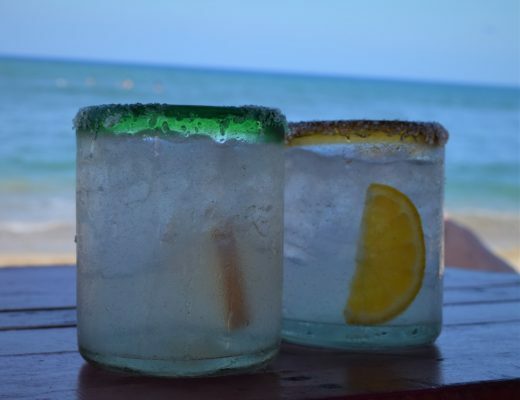 As always there are more pictures in the destination photos section of the blog. 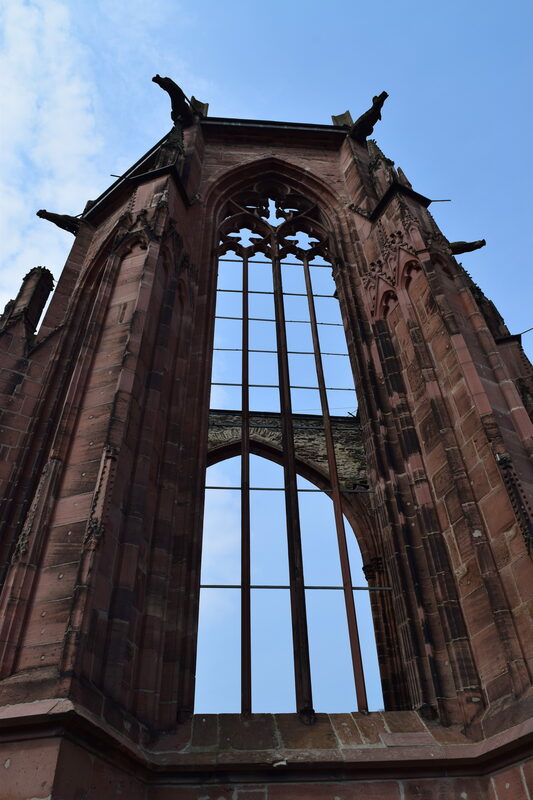 Previous Post Heidelberg Germany, the GlobeTurners' European tour begins.